The National Transportation Safety Board is investigating an incident in which a Delta Air Lines Boeing 777 experienced an uncommanded engine rollback in the cruise phase of an intercontinental flight. 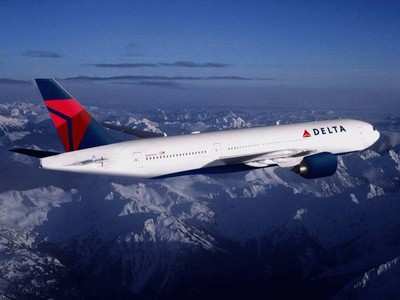 On November 26, 2008, at about 12:30 pm MST, in the vicinity of Great Falls, Montana, a 777-200ER (N862DA), operated by Delta Air Lines as Flight 18, en route from Shanghai to Atlanta, experienced an uncommanded rollback of the right (number 2) Rolls-Royce Trent 895 engine while at 39,000 feet in the cruise phase of flight. The crew executed applicable flight manual procedures and descended to 31,000 feet. The engine recovered and responded normally thereafter, and flight continued to Atlanta where it landed without further incident. None of the crew of 15 or 232 passengers was injured. Flight data recorders and other applicable data and components were retrieved from the airplane for testing and evaluation. Both of the pilots have been interviewed. The NTSB notes the Delta event was preceded by another airline's 777 equipped with Rolls-Royce Trent 895 engines. As ANN reported, a British Airways 777-200ER experienced an uncommanded dual engine rollback while on final approach to London's Heathrow International Airport on January 17, 2008, crashing short of the runway on airport property. The United Kingdom's Air Accidents Investigation Branch (AAIB) is investigating that accident. While a final report has not been issued, investigators have focused on the possibility of ice crystals forming in fuel lines due to a larger-than-normal amount of water in the fuel, combined with extremely cold temperatures along the flight's polar route from Beijing. The similarities in both incidents -- including plane type, and the Chinese origination points of both flights -- are not lost on either investigative branch. NTSB Senior Air Safety Investigator Bill English, who is serving as the US Accredited Representative in the Heathrow accident investigation, is the Investigator in Charge of the Delta incident. Conversely, AAIB has assigned an Accredited Representative to the Delta incident. Parties to the investigation are: the Federal Aviation Administration, Boeing Commercial Airplanes, Eaton-Argotech, Delta Air Lines, and the Air Line Pilots Association.